This is the last of the recipes I made for my Easy Potluck Party foods class at the Utah Home show last week! These are all super fast and easy to make, yet still tasty and impressive for the other guest to enjoy! Do you have a favorite dish you like to make and take to holiday parties? Recently I did a live cooking show making 8 different potluck recipes, mostly dip, all great for game day recipes! Serve immediatly to keep the toffee crunchy, refridgerate any extras. Serve with fruit. 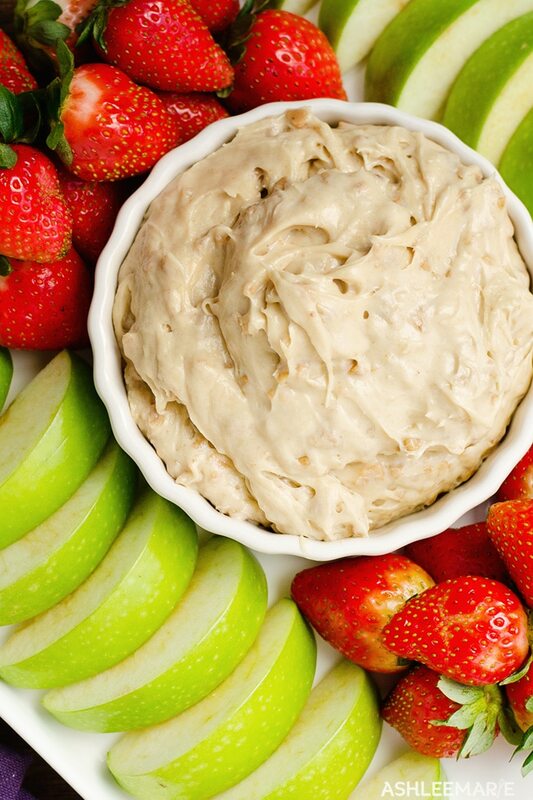 Apples, strawberries and bananas are our families favorites. What’s your favorite thing to bring or eat at parties? Maybe a dish I forgot to include on my list. Do you head towards the savory or sweet dishes? Personally I head towards the savory, probably because I make my own sweets so often I enjoy trying new dishes either way though. and this one is seriously so easy too, I mean I have all the ingredients for it at my house all the time, so I can just whip it up anytime. 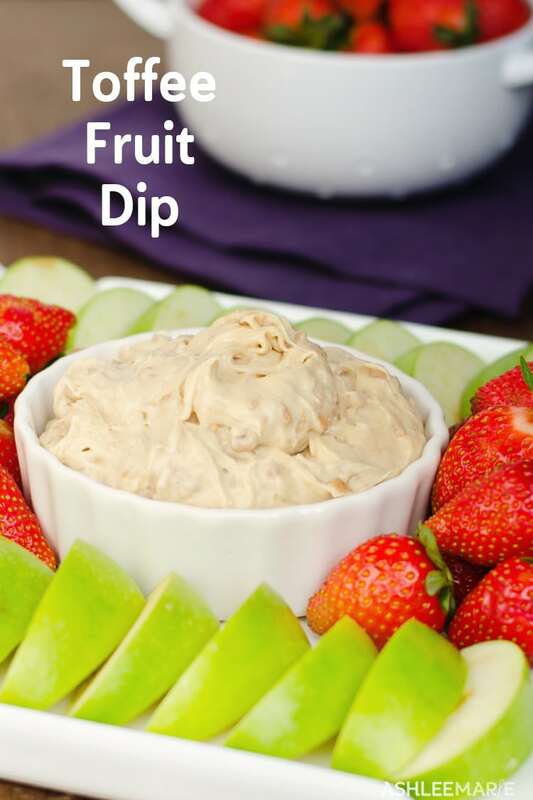 I’m a sucker for all kinds of fruit dips and this one sounds and looks amazing! I’ll have to make it soon! 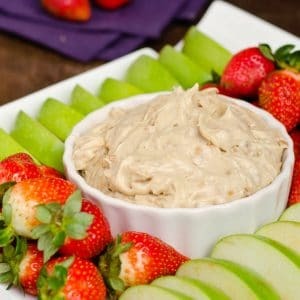 I like my strawberries dipped in sour cream and then brown sugar, but I love love LOVE this one for my apples, better than caramel because it doesn’t stick in my teeth! 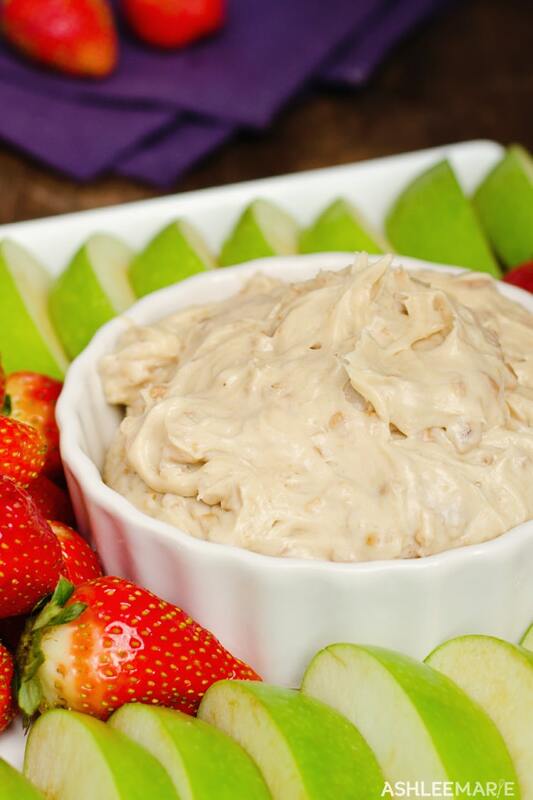 This is my favorite fruit dip ever. I might be able to eat the entire thing….by myself…. in one sitting. Yum! Love this! I agree, so amazing! Do you like it with the plain toffee or with the chocolate toffee? All of your recipes have been so fabulous! Thanks for sharing with us – PINNING! aww thank you so much! It’s been a fun series to do! I often forget the simple recipes are worth sharing too! I loved the toffee bits that were added in! But I couldn’t find them at smith’s or walmart. Where’d you get them? weird, I don’t shop at either anymore (my grocery deliver had it) but I swear I saw them at smiths before. I think I saw them at Dan’s the other day too. Maybe seasonally they’ll do better. I know my smiths doesn’t carry everything all the time.